Onion (Medium Size) - 3 No. 1. Keep all the ingredients ready for making instant adai. Finely chop the onions. 2. Add all the flours, red chili powder, cumin seeds and salt to a mixing bowl. Add water little by little and make a adai batter. The batter should be really thick. Refer the picture below. 3. 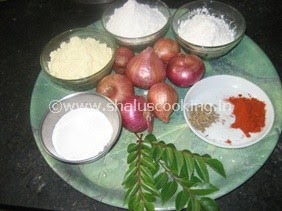 Add the chopped onions and curry leaves to the batter and mix it well. 4. Heat a tawa and grease it with some oil. Take a handful of batter and drop it on the tawa. Wet your hand and spread the batter to circular shape using your hand. Add little oil around the adai. 5. Once it is cooked on one side, flip it to other side and allow it cook on medium flame. When it is cooked on both sides, transfer it to a plate. Instant Multi Flour Adai adai is ready to serve. Usually Avial makes a best combination with Adai. But can be served with coconut chutney too.